Bluetooth earbuds are the hottest things on the market now, but the varying features make it hard for anyone (even me!) to pick which is best. So, if you’re looking for Bluetooth earbuds, wireless earphones, or the best IEM (In-Ear Monitor) with Bluetooth 5.0 technology, we got you covered. We’ve rounded up the best rated wireless earbuds to present you with this year’s best wireless earbud compilation. Does it Come with a Microphone? Let’s start out with the hottest cordless earbuds out there: the Apple AirPods. These aren’t your ordinary wireless earbuds because they literally cost a fortune, coming in at around $150 (and the newer version cost around $200). But as expected from a wireless earbud that costs this much, they sound stellar. By that, I mean you don’t just hear the wholesome bass beats of Sean Kingston’s Fire Burning but you can also hear the nicely cut mid and treble notes of Bob Marley’s Turn Your Lights Down Low-- not to mention the crispy backup instruments and backup voices. You can only enjoy listening to music for up to 5 hours of use but with the portable charging case, it’ll last for more than 24 hours. It’s just unfortunate that these don’t have an official IPX rating, so there’s really no telling how they can resist environmental elements such as dust and water; we’d suggest being careful just in case. On top of that, these earbuds don’t really have outstanding wireless range-- although it’s rumored the Apple AirPods 2 have better range-- which we’ll also uncover ourselves soon. Aside from that, these don’t have noise isolation features like most premium earbuds. As for controls, the AirPods don’t have any in-line buttons at your disposal. You do have Siri (which can be activated by double-tapping either side of the bud) and voice-activated functions to adjust the volume, answer calls, skip tracks, and perform other audio-related programs. Part of us also wishes there were tips of varying sizes, but we get what Apple is going for here. If you’ve tried their normal earbuds, then you already have an idea about they fit on you. This would have been our #1 Bluetooth earphones on the list if not for the exorbitant price tag. Currently, these things cost around $300, and even if they sometimes go as low as $270, it’s still expensive! If money isn’t a problem, though, it’s hard to not recommend the Sennheiser Momentum True Wireless since these are some of the best sounding wireless earbuds. Starting off with the sound quality, it’s spectacular. Thanks to Sennheiser’s new 7mm driver and the Bluetooth 5.0 earbuds, it’s as if you’re there on the stage with the band. The instruments and the voices are crystal clear, and everything from the lows, mids, and highs sound so much better compared to Apple’s AirPods. Yet another thing that makes this better than the Apple AirPod is the Transparent Hearing feature that records the outside noise and transmits it into your ears to keep you in touch with what’s happening around you. And lastly, these are carefully designed to make volume and other adjustments work easily. Tapping the left bud according to its set pattern lets you control the volume and skip tracks while tapping the right activates the voice controls. There’s no denying that Jabra Elite 65t is Apple AirPod’s strongest competition in the $150 price range. 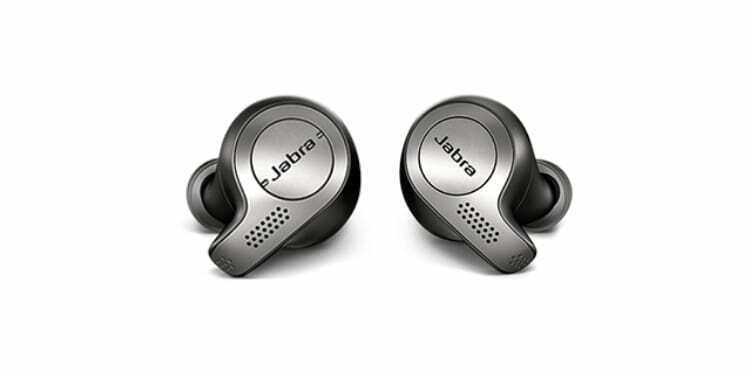 Starting off with the design, Jabra’s Elite 65t has a more mature design; although, depending on the color, these can look a little business-y, which you might not like. 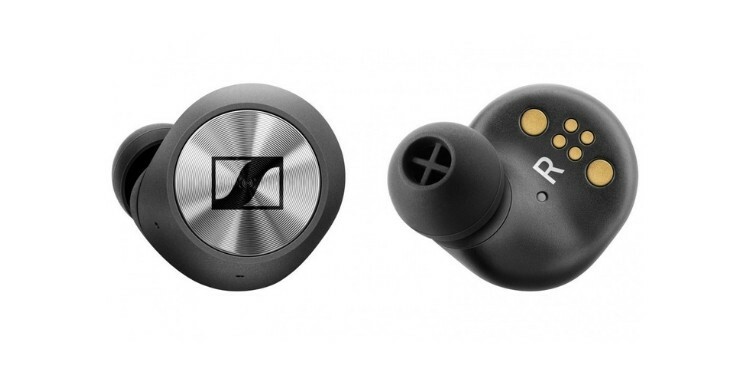 Like the above Sennheiser, each earbud has its own preset controls: the left earbud controls the volume/skipping tracks; the right earbud lets you activate your voice assistant. The right earbud does act as the master bud so take that if you wish to take calls with only one bud. Unlike some of the other best rated wireless earbuds, this automatically turns on when you take them out from the case and also turns off when you put them back. In terms of sound quality, it sounds almost identical to the AirPods-- there’s balance, warmth, and clarity. That being said, we do think these win out by a hair. One thing that truly sets it apart from the AirPods is its ability to clock tons of external noise, which can be adjusted via Jabra's mobile app (available in both Android and iOS). It even has presets to fit various situations, such as relaxing or commuting. 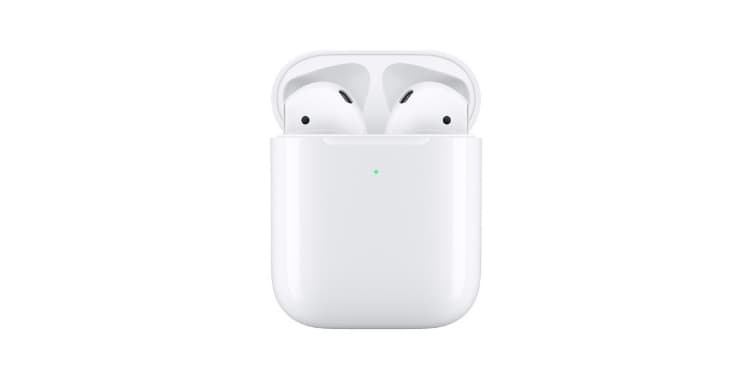 Needless to say, it’s undeniably better than AirPods in a lot of areas and even built for intense workouts since it’s rated IP55, which means it can withstand both dust and and powerful waterjets (a detailed explanation of the IPX rates can be found further below). But keep in mind that it’s also a little bit more expensive. 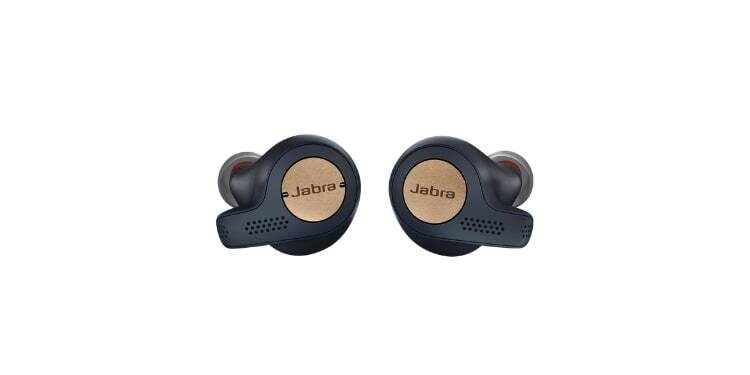 The Jabra Elite Active 65t is very similar to the Jabra Elite 65t above. In fact, there are no major physical differences between the two-- it even has the same slippery yet elegantly designed plastic material and the IP56 rating. What makes the Elite Active 65t better is the fact that it has a slightly better IPX rating now (features IP56 instead of IP55), perfect for sport-centered individuals. On top of that, it also has a slightly better audio clarity and quality as well as an integrated motion sensor that tracks your steps via the companion app. If we’re being honest here, you’re better off with a dedicated device that does so. 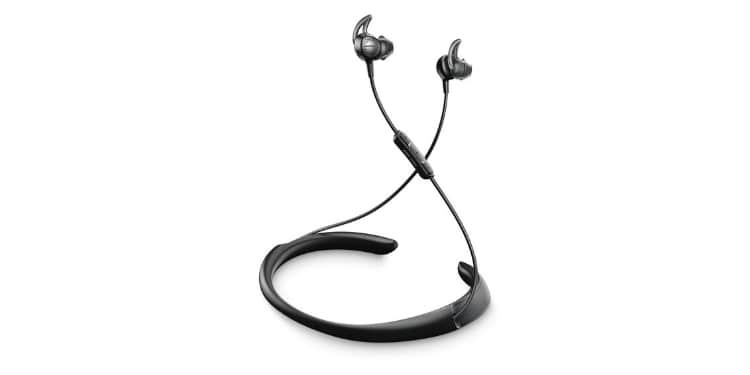 So, unless you really want your Jabras to be fitness-focused, you can take a step back and get the Jabra Elite 65t instead, and save $20 to $30. We specifically want to feature the Bose QuietControl 30 because of how it excels with its noise cancellation feature. When I say noise-canceling headphones, you’ll probably think over-ear headphones that go on your ear and not inside your ear canal. However, that’s not actually the case and Bose shows us exactly why with this product. In fact, its noise canceling feature performs so well that it’s on par with the over-ear Bose QuietComfort 35 Wireless Headphones II. Unlike the other premium earbuds on this list, these have a unique neckband design that securely sits around the back your neck. This has its own set of pros and cons. You don’t really have to worry about losing this (until you take it off), and you can easily take the earbuds out without having to actually store them away. Still, they’re always there, some people might find the band too large, small, or just that it clashes with their style. The band also makes it harder to store when you need to, like if it’s raining. Unfortunately, you can get good Bluetooth headphones with better sound quality at cheaper price points. You still get a solid, punchy, low-frequency bass when listening to Lil Wayne’s A Milli but it fails to produce stellar high notes like some of its competitors in the $300 price range. The Bose SoundSport Free is an excellent sounding pair of earbuds built to work out the challenges of working out. When marketing to people that are working out, there are some special concerns you have to take into account, like the fact that you are going to be moving around a lot. This is where these earbuds immediately get in trouble. The outside piece is notably larger than on the outside. In fact, there have been many instances and comments about how poor it fits when worn-- and that is in spite of the 3 different sized tips and an in-ear hook design. For some, this won’t be a big deal, but for others, this might mean they either hurt your ear, fall out more frequently, or both. For this same reason, it is disappointing that these are only IPX4. I mean, that should be fine, but if they’re falling out of your ears or getting extra sweaty from an intense workout, then it’d be nice if they were at least a little more rugged. 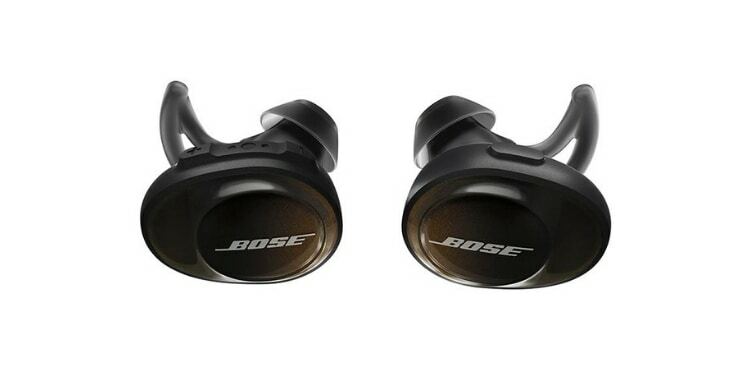 Sound-wise, these offer the same stellar audio quality we’ve come to expect from Bose. The bass extends the lows and the highs make everything sound crystal without overdoing it. However, it’s worth noting that they only sound great when you wear them in a quiet room or environment as it doesn’t really block much external noise. The Samsung Gear IconX outperforms its predecessor in terms of battery life. In fact, Samsung specifically intended to improve its battery to address the problems they had with the previous model. That being said, its 5-7 hours is pretty normal overall. One feature that really sets these apart is its 4GB of onboard storage. This means you don’t even need your phone to listen to your favorite music. Just put the earbuds in the case and hook it up to your phone to transfer music from your phone to the earbud’s storage… of course, without your phone, you are just skipping around between random tracks. Sadly, these don’t play well with iPhones, because that extra storage would be great if you’re an iPhone user who doesn’t want to splurge on getting an iPhone with more storage. Continuing with that trend, if you’re an Android user who already uses Samsung’s S-Health app for working out, then these are a great option to keep track of what you’re doing while running or working out. These can track your steps, speed, distance, calories, and even offer real-time voice guidance. Sadly, they only have an IPX2 rating. I poked fun at the Bose SoundSport for only having an IPX4 rating while being marketed towards those who are more athletically inclined, so I sure as heck couldn’t spare Samsung for being worse. Sound quality isn’t groundbreaking but it has a decent balance. It would have been a lot better if the equalizer presets on the app worked all the time. It does fit snuggly in your ear and they don’t really fall out easily. However, its case isn’t that secure. In fact, your earbuds will easily fall out if you accidentally drop the case. Just bear in mind that this doesn’t support iOS so they’re technically one of the best wireless earbuds for Androids phones, not iPhones. The JBL Endurance Sprint is not your ordinary budget-meal earbuds. In fact, it boasts a powerful bass response that’s perfectly matched with clear highs. 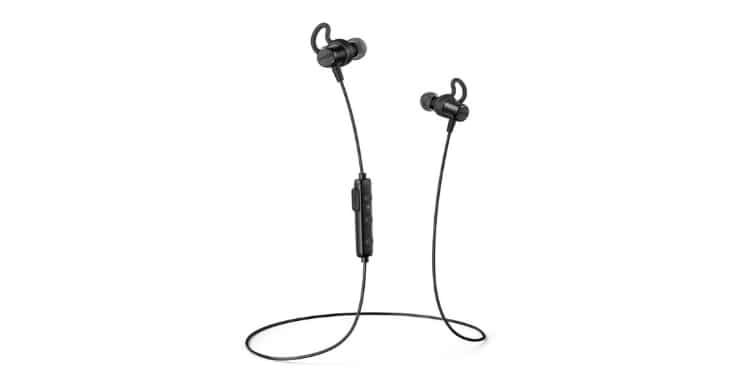 We can easily say this offers the best audio quality in the budget category and it is even competitive next to some of the more sporty earbuds since it has better noise cancellation. Its build is a little bulky, but that’s not without reason: it’s designed to seal out environmental noise. It also has some dedicated noise cancellation, but since it falls into the budget range, there isn’t any control to turn this off. Even more surprising is it has an IPX7 rating, which means a considerable amount of sweat won’t do any harm to the device-- perfect for athletic individuals and people who go to the gym. And if you do mess them up, these are imminently more replaceable than the Bose SoundSports that cost nearly 4 times as much. The two earbuds are also connected together by a leash, which means it’s harder to lose these than many of the other earbuds on the list. Lastly, the battery life is outstanding as it’s rated to last up to 8 hours. So, if you’re an active individual whose budget is limited, these should be great for you. 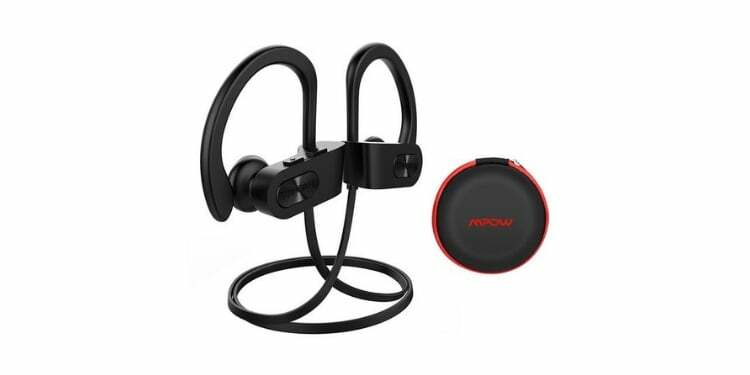 One of the best budget-friendly Bluetooth earbuds you can get today is the MPOW Flame Bluetooth headphones. With over 13,000 customer reviews (4.2 /5-star rating) on Amazon, these sub-$20 earbuds are surely worth considering. This may be cheap but it’s undeniably popular because of its featureset. Starting off with the IPX7 standard, which means these are perfect for you if you’re active, especially around water (or if you’re sweaty, no shame!). It also has an outstanding battery life of up to 9 hours with a fast charge of only 1.5 hours. Even more surprising is the fact that this also has a richer bass and better audio quality compared to most of its competitors in this price range. Just don’t expect groundbreaking sound quality that's as good as the premium entries. In terms of comfort and functionality, it can fit snugly in your ear, thanks to the improved ear hooks design with controls conveniently located on top of each piece. The metal MPOW logo on each side also looks sharp and makes these like a little more premium than they actually are. 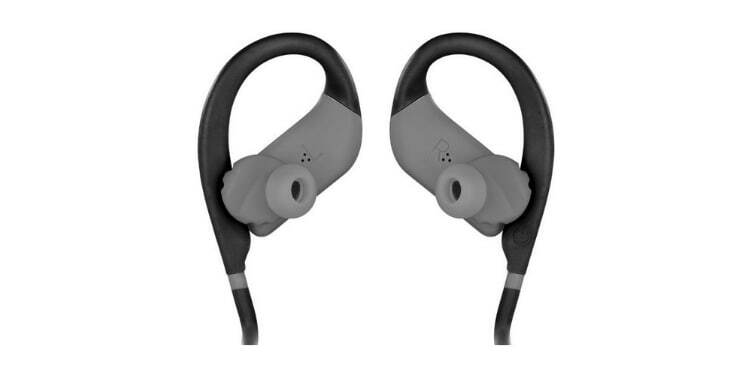 Coming in at around $20, the Anker SoundBuds Curve is the best value in the budget category. It doesn’t look cheap and its battery can last up to 14 hours (with volume at 40%). The bass is obviously lacking but the treble is surprisingly outstanding although it does have an uneven sound quality. However, considering it only cost $20, that’s to be expected. Its design boasts the typical in-ear fit and even handles noise isolation really well. And, much like most of the budget earbuds on the list, both earpieces are connected via a wire that goes around the back of your neck. Its IPX4 rating means it should hold up fine if you’re running errands in them or just doing some light workouts, but the two other budget options might be better if you sweat a lot. If at this point you’re still unsure which earbud is for you, consider reading the following tips to take the confusion away. This should give you a clear understanding which is best for you. Honestly, this is pretty straightforward. Most earbuds give you about 4-6 hours of listening time. The earbuds which have the longest advertised battery lives are also the cheapest ones. Since budget is likely a larger factor, that will usually take care of itself. It is worth noting that some of these come with cases that will charge them while in storage, like the Apple AirPods and Sennheiser Momentum True. This drastically increases your functional battery life. Moreover, it is important to note that different activities use more battery life. For instance, phone calls use your battery life faster. Having the volume louder also depletes your battery faster. People have their personal “taste” or standard when defining sound quality. But when it comes to Bluetooth and sound quality, it depends on the type of audio codec the sender and the receiver device uses. Basically, audio codec refers to the software that encodes and decodes the audio data stream. Old versions of Bluetooth use the SBC (Sub-band Coding) audio codec, which compresses audio heavily to the point that the digital quality of the sound is greatly affected or decreased. But newer devices– specifically, Android devices from the last few years– support newer and better audio codecs like aptX, which streams at 352Kbps with lower latency. These encode the audio data streams in a more efficient way to produce CD-like audio quality. The aptX HD is basically an upgraded version of the aptX audio codec and streams at a higher bitrate of 576Kbps and a much lower latency. On the other hand, Apple devices the like iPhone and iPad use the AAC sound codec. It’s basically an upgraded version of SBS and streams audio at 256Kbps. This audio codec is basically comparable to aptX, if not better when used efficiently. Technically speaking, even if both devices use different codecs, you can still play music via Bluetooth. It’s just that you’ll hear the best audio quality if both devices use the same sound codec. The importance of a comfortable fit is immediately apparent, but finding one is often only accomplished through trial and error. That being said, there are a couple of things to keep an eye out for. For instance, most Apple earbuds fit similarly; if you’ve tried one pair, then you know whether they fit you well or not. You might also want to watch out for other aspects of the earbud, like a hook design, or large pieces that stick out of your ear. Range is something very few people will need to actually consider since 95% of the time you will just be connected to the phone that’s in your pocket. However, if you’re using a different connector, or– dare I say it– you let your phone out of your sight, then you might want to actually pay attention to this spec. Needless to say, wireless earbuds with microphones lets you do more than just listen to music. Some of these are made primarily for either music listening, communication, or entertainment while some are equipped with a 2-way microphone that controls what you hear by taking auditory information around you and using it to cancel out some of the obstructions. Earbuds are given an IPX rating. This rating represents how resistant they are to environmental elements such as water. Basically, they are rated from IPX0 (no protection) to IPX8 (Protects when immersed in water over 3 feet).